It's Beginning To Look A Lot Like Christmas Cats? Well, it's the day after Thanksgiving, and we take this day to put up the tree and decorate for Christmas. We laugh every year when we pull these cats out of the Christmas boxes and give them a squeeze. Also, notice the Starbucks ornament over the black and white cat's head. I am a Gold Card member so...seriously, you should register a Starbucks Card. I get free coffees, free refills, free syrups, free, free, free. I've always liked this song. My old roommate and I would play FPS video games while listening to System Of A Down and other hard rock. I mean, what better music is there for killing bots and noobs? Anyway, I don't know what this girl is wearing, but I do know she makes Chop Suey! sound really good. It's a powerful classical type sound. Maybe the artfulness is the real reason for the songs success. I want one of these. I want all the Starship Enterprise Technology for my home. I posted a similar type video in May of 2008, but this one is clearer and more detailed. In October 2009 I discovered Pomplamoose. I fell in love with their style of making music and something they call VideoSongs. Fast forward to today, and these two are now making commercials Hyundai. It's exciting to see someone so talented be successful. Great job guys. Also, what I treat for me. They combined two three of my passions into one video; automotive, music, and Pomplamoose. Check out my other posts about them here. And check out Pomplamoose on YouTube. Special thanks to TechyTed for sending me the video link. I started writing this post yesterday, but I was on kid duty and ran out of time to finish it. 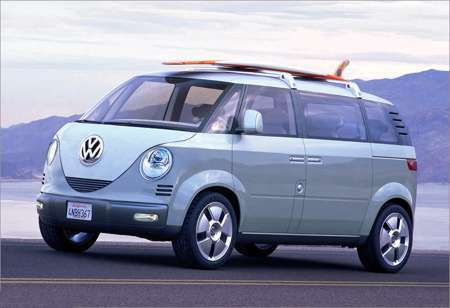 Then today I see that Autoblog tweeted about VW's design chief saying a new Microbus is in the cards. While that announcement is SOOOO exciting, it takes away my thunder. But, I'm still posting this because I know my loyal fans need something new to read, as my blog has been lacking entries for a few weeks now. Why don't I know how to use Photoshop? I need to know how to use it. I have so many ideas (I think are great) for vehicle revisions. Take Volkswagen for example. 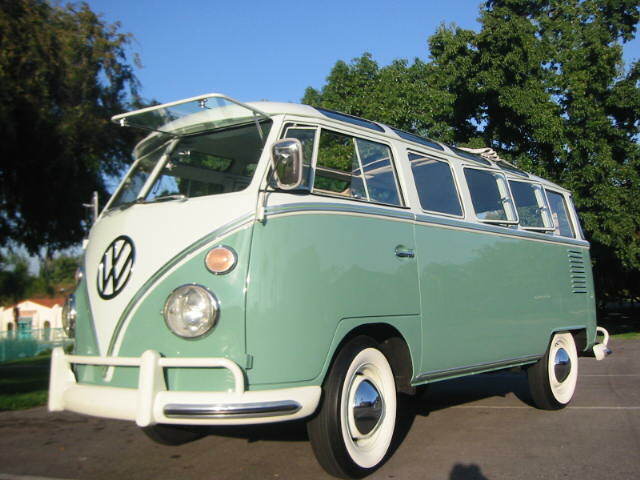 They created the Microbus in the 1950's. Now, they've moved to a modified Dodge Caravan, completely losing their focus on European design and ingenuity. Why? Because they think Americans want more crap? I don't know. But Dodge was sure not the way I would have gone. Look at the original Microbus or "Bus" as so many people call them. This is a totally cool looking van. If it was modernized, like the Beetle (or "Bug") was, the Microbus could take a whole segment of vehicles retro and make the "minivan mom's" seem cool again. Nissan and Toyota redesigned their vans, but VW has the retro game down. And, because VW has the nostalgia of the Bus, they could get away with some really cool things. A few years back, they did come out with a Microbus concept, but it didn't take off for a few reasons. Second, although pushing the wheels out to the edges is one of the things I love about VW's, this concept pushed the wheels beyond the outer edge to where they had to design fenders that popped out too far too. Also, the rear wheels seem to be falling off the back of the van. I do love that it is really close to the same shape as the original. I love that there are vents in similar places to the original. I love that inside it has some of the things the Bus is famous for, tables, movable chairs, etc. I'm not sure about safety issues or why the engine can't be in the rear, except for the fact that this would never be built as a rear wheel drive vehicle, but it would be awesome if they built it that way. If they did this, they could push the driver forward even more, giving that "no nose" front end to the van. Again, safety standards today may require a crumple zone in front to provide protection for the driver and front passenger, but I just wanted to mention it. In reality, this is going to be a front or all wheel drive vehicle and the engine placement would work better in the front. 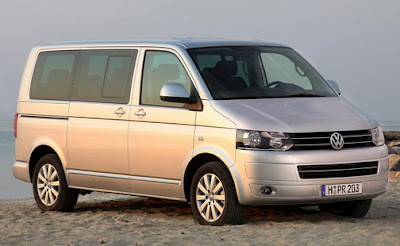 VW did have the Vanagon and the Eurovan, which were both pretty unsuccessful here in the USA, but they are more true to VW style than the current Routan, which is based on the Dodge Caravan. 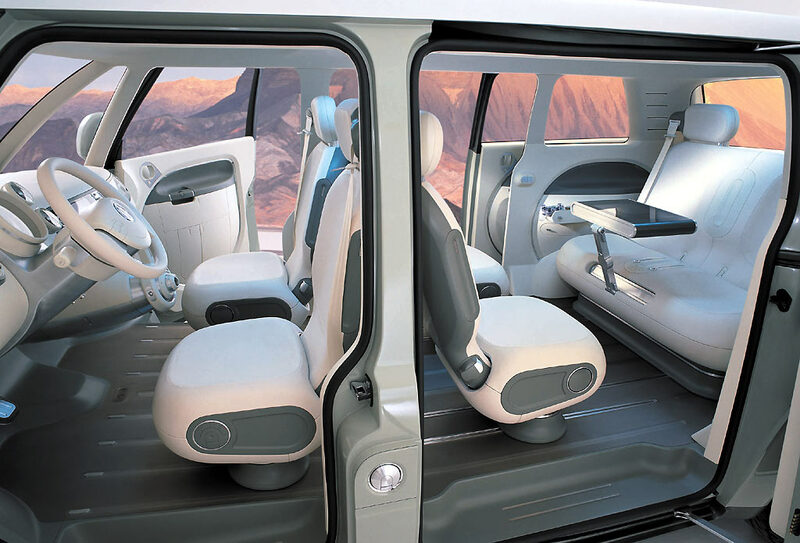 The Vanagon and Eurovan were more boxy than rounded like the Microbus, but they had some of the VW interior queues that made these vans really practical. This van still exists (not here in the USA) and its latest form is shown in these two pictures (silver is standard, black is customized). 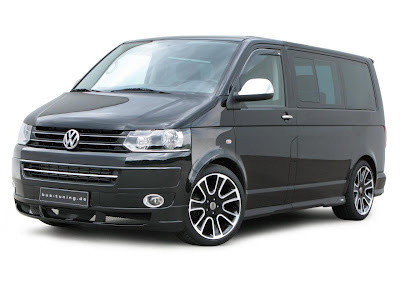 I actually like these as a starting point for the new Microbus. First let me say, I learned to drive on a 1976 Diesel Rabbit, I purchased a 1999 VW "New Golf" as my first new car purchase, and I'm now wishing I could replace my '99 (which is over 190K miles) with a 2011 Golf. I love your company. I believe you know how to make vehicles that are fun to drive. I believe you know retro. I think that American's love retro too. The Beetle was a success, and other companies have had huge success with retro designs as well (Ford Mustang, Dodge Challenger, Chevy Camaro). It's time for a Microbus, one for those of us who need the capabilities of a van without all the ugly minivan stereotypes. The VW Microbus could be that answer. Take design queues from the old Microbus with modern family traits from today's T5 model. Make us a retro style Microbus that no one will consider "just another minivan." Do it right VW. Do it well. Make me proud to be a fan, a family man, and a future Microbus owner. Delivered Over To Satan So The Spirit May Be Saved? The memorial service for Doug Healing was amazing. He was a true example of what a Christian should live like. People got up and spoke about Doug from all aspects and times in his life, and the consistent message was that he was a godly man. Through this whole thing, I've really had to take a look at my life and I've realized there is nobody that can say the types of things about me that were said about Doug. There aren't people from work that would come and say I loved the Lord and I was always sharing my faith. I don't even know if there are people that would come say the standard, "he's a good guy." I need a drastic turn around in my life. I need to live like I'm required. I need to glorify God and make that my chief priority. 1 Corinthians 5:1-5 talk about a sinner in the church needing to be removed. Paul pronounces judgement on this person and tells the church they are to "deliver this man to Satan for the destruction of the flesh". Yikes. They do this "so that his spirit may be saved in the day of the Lord." I do not want to be separated from the church. I definitely don't want to be delivered over to Satan, but I'm a reached sinner living in arrogance and sin, instead of working to glorifying God with my life. We all need to take a look at how short life can be and what our example is here. Right now, I've done the kingdom of God no good. I've failed to witness to the people I work with. I'm a Sunday morning Christian. I really don't know what the fix is either. I don't know how to recover and change at work. It's going to be a slow process of changing people's opinions with the way I act and speak. Prayer and continued study are all I have. I have no strength on my own. Have you heard about Google's self-driving car? If you read my blog on a regular basis, you would have seen the article I posted here. But, as a refresher, Google has a Toyota Prius that uses cameras, lasers, and radio frequencies to control the vehicle, allowing computers to do the driving. Now, my genius brain has come up with something Google can do to make this system useful right now and get some major beta testing free of charge. 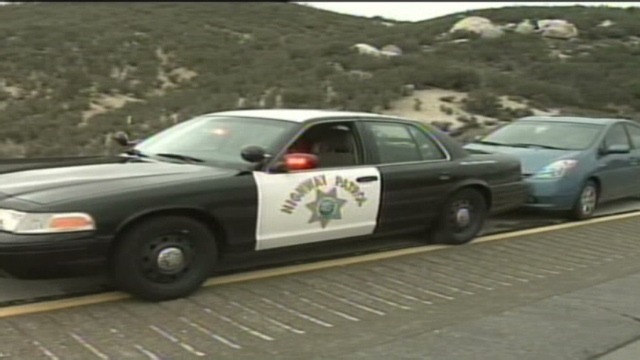 Google could offer law enforcement agencies across the nation the use of this system in patrol cars. First, this would allow officers to use their MDC or Mobile Data (or Digital) Computer, without the worry of crashing into someone or something. It would make it easier for an officer to read the details of an incoming call, the records checks on persons or vehicles of interest, and even allow the officers to write notes or reports while still moving through their designated beats. Second, Google could also offer their excellent maps services to help officers locate the exact location of a call, and the fastest routes to them. And finally, law enforcement officers are already the cream of the crop in our society. They write reports all day long, they are very observant, and they love to be "in the know" about everything. They would prove to be an excellent resource for feedback on the system, they would test it to its limits, and would be honest about its performance. I do realize there are some old guys in every department that are any technology. I also know there are guys that are too busy, too active, or too tough for the system. I get that. But, every department has the middle of the road officers too. These guys do their job, go to calls and do some proactive police work. They are decent report writers. And these are the guys that are looking for tools to help them in their performance. These are the guys that should get the test cars. It would only take 1% of the police force for Google to get a great sampling of its software's performance. Anyway, that's my idea. Let's do this Google. I'll get you into at least one department where I have connections. Call me. I mean, I do have a Google Voice line. Although many people prayed for healing, God decided he wanted to bring Doug home to Himself. If we can think about it from Doug's perspective, he is in total peace with God. God decided it was time for Doug to enjoy Him in His presence, and that is so great for Doug. I feel sadness for the family. I really hurt for Josh, who was with his dad when the accident happened. Obviously, the whole family is hurting, but as a son myself, I would not want to be with my dad when a life ending accident happened to him. Continue to pray for the Healing family. Pray for peace for them. Pray for provision for Betsy. Pray for the comfort that comes from knowing God. I just looked at my last post and I noticed I mentioned our time here on earth is short. We really don't know when and how we are going to die or if Christ is going to return. Monday evening, my dad received a call about a close family friend falling off a his roof. He apparently broke is neck and ribs. At this point, we are not sure he is going to make it. I know that I often think to myself I'm going to get my life right with God later or I'll be able to be a good witness next time. But the truth is, we don't know how much time "later" we have. We don't know if there is going to be a "next time". God could decide to take us home at any minute. We need to be living our lives correctly, properly worshiping God and glorifying Him with all aspects of our lives, right now. I really wanted to write this to request that you pray today for a miracle for Doug Healing (his actual last name). He would need major healing from all the injuries. He is probably paralyzed from the neck down. They're not sure about proper brain function at this point. God can do miracles if He desires. My pastor talked about death a few weeks ago and reminded us that the death of a Christian is awesome for that person. They get to be with God. And, although we miss them and wish they were still here with us, the truth really is, they don't want to come back. Once they are in the presence of the Almighty Creator, they are pain free, worry free, in perfect peace and joy. Please pray for comfort for the family. Pray that God is glorified through this tragic accident. Paul really does rebuke the church at Corinth a lot. But he loves the church and in 1 Corinthians 4:14-20 he reminds them that he writes to them in this manner not to make them ashamed, "but to admonish (them) as (his) beloved children." He refers to himself as their father in Christ Jesus. He also rebukes those that are arrogant and think they can get away with poor leadership and direction because Paul isn't going to come back. But Paul tells them he will come back if it's God's will. He also sent Timothy there to help the church and to report back to Paul. He tells them he will find out the power of these people and deal with that, not just what they are saying, because the kingdom of God consists of power. And Paul's final warning in this section is that when he returns he can come back ready to punish or to love in gentleness, and it's up to the people of the church. Seriously, we have a short time here on earth. How can we make it right and good? How can we find joy and satisfaction in worshiping God with our lives and our actions? What do we need to do to avoid sin and run away from temptations? How do we clear our minds of things of this world and focus them on the things of God? Colossians 3:2 "Set your minds on things that are above, not on things that are on earth."